Chhath Puja, the historic Hindu festival dedicated to the god of energy, is also known as Dala Chhath or Surya Shashti. Chhath Puja is an ancient festival popular in Bihar, Jharkhand and eastern Uttar Pradesh. The festival is gaining popularity in other cities of India as well. This historic Hindu festival dedicated to the god of energy is also known as Dala Chhath or Surya Shashti. How long is the Chhath Puja celebration? The festival is celebrated on the sixth day after Diwali in the Hindu calendar month of kartik. Devotees worship the Sun God at the time of rising as well as setting to thank him for the natural benefits it is spreading all over the world. The rituals span across four days. The fervour around the festival is marked by offering prayers to the Sun God, fasting and taking dips into the holy water bodies. For those who observe Chhath Puja, the occasion is also a rigorous one that encourages prudence and abstinence from food and water for the accomplishment of the desires of observers. Those who observe fast have to go without food and water for long durations over these four days. The first day is called ‘Nahan Khan’ or ‘Nahai Khai’. The devotees take sacred bath in a holy river in the morning and carry water from the same source to their home to prepare prasad for the Sun God. The worshippers eat only once on the first day. Sun is worshipped with a notion that it will cure a variety of diseases including leprosy. The observers strongly believe that God of energy helps ensure longevity and prosperity of family, friends and elders if the festivity is observed in right manner. The second day is famous as ‘Lohanda’. On this day, women observe a fast for the whole day and end it after sunset. After that, the toughest fast starts for another 36-hours during which the devotees don’t even sip water. On the third day, after preparing prasad, people take holy dips in the water bodies at the time of dusk and worship Sun God and Chhathi Mata. The entire family and friends accompany the woman who observes the hard fast to the river bank to offer evening rituals ‘Sandhya Arghya’. The folk enjoys singing songs meant for the occasion. On the last day, observers gather around the same river and offer morning puja ‘Usha Arghya’. After this ritual, devotees break their fast and distribute prasad among family members and friends. A special sweet called ‘Thekua’ is prepared by all households to offer as prasad. Various other sweets and fruits are also an important attraction of prasad. The festival is round the corner. Ghats have been spruced up, roads have been wiped clean and all provisions are in place as people of Bihar and Uttar Pradesh are all set to observe their most awaited festival of the year. Although, it is a family time, so many people prefer to go to their hometown to join and enjoy family gathering. Worship the Sun God ardently and pray for the welfare and prosperity of your loved ones. Tuesday, October 24. 2017 is the day of holy bath and eating. Wednesday, October 25, 2017 is the day of fast that ends after sunset after 36-hour long fasting. Thursday, October 26, 2017 is the day of evening offerings known as Sandhya Arghya. Friday, October 27, 2017 is the day of sunrise offerings known as Suryodaya Arghya and breaking of the fast. 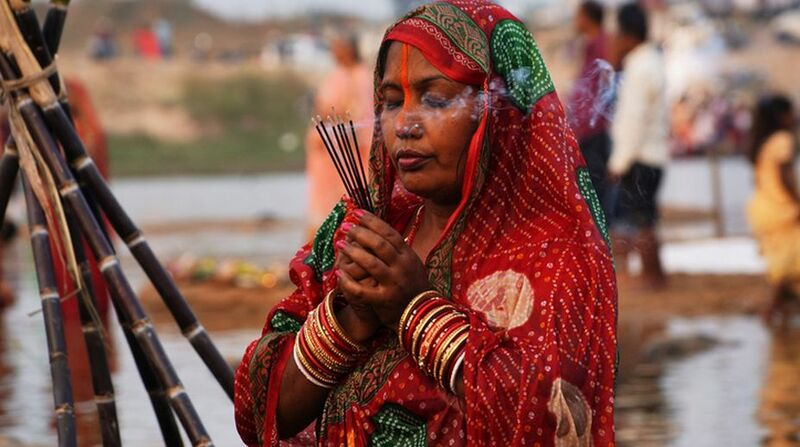 Chhath Puja: Who is Chhathi Mai and what’s the Puranic reference of this festival?